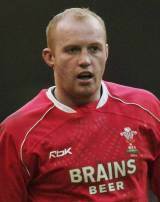 Martyn Williams made his international debut in 1996 against the Barbarians. The openside flanker became one of his country's most consistent performers, excelling in both the 2005 and 2008 Grand Slams. His finest hour in a Wales shirt may well be his superbly timed brace away to France in the 2005 Six Nations, turning the game and the tournament in Wales' favour. Williams began his career with Pontypridd, winning the 1996-97 Welsh League before moving to Cardiff RFC in 1999. His early career in the Wales setup was spent at No.8, although his greatest success has come with the technical expertise he has displayed at openside flanker. Wales coach Graham Henry selected Williams for the 2001 British and Irish Lions tour to Australia, although he was unable to force his way onto the field during a Test despite being selected as a replacement for all three matches. Williams was selected for Wales' 2003 World Cup squad, having earlier signed for the newly regionalised Cardiff Blues, although his involvement was often limited to cameo appearances from the bench. A try against England in the quarter-final was not enough to stop Wales from exiting the tournament. Williams continued to feature regularly in Wales squads following the World Cup, but again he was often employed as a replacement. This would all change with the start of the 2005 Six Nations, as Williams was selected for the opener against England and started every subsequent game on Wales' way to a Grand Slam. Williams was voted as player of the tournament and was selected for his second Lions tour by Clive Woodward in 2005. Despite having been the outstanding player in the Six Nations, Williams was only granted one substitute appearance in the final Test while on tour. Following disappointing Six Nations campaigns in 2006 and 2007, Williams and Wales went into the 2007 World Cup low on confidence. While he was dependable as always, scoring tries against Japan and Fiji, Wales exited the tournament with a whimper at the group stage. Williams announced his retirement from international rugby immediately following the game, leaving Wales with a gaping void on the openside flank. He was eventually convinced to end his retirement by new Wales coach Warren Gatland, and it was a decision that led to him playing an integral role in the 2008 Wales Grand Slam. He was selected for the 2009 Lions tour of South Africa and made the bench for the first and second Test losses, before being selected at openside in the third - winning his first start for the Lions in Tests. In January 2011 it was announced that he would not be offered a new contract by Cardiff Blues as part of cost-cutting measures and a bad month was completed with his omission from the Wales squad for the Six Nations. However, the Blues then confirmed before the end of the season that Williams had signed on for another year. Williams made a return to the Wales side in a Rugby World Cup warm-up against Argentina, but failed to make the cut for the squad. Nevertheless, he was honoured with an MBE in the New Year honours list. In February 2012 the Blues confirmed that he would not be offered a new contract.